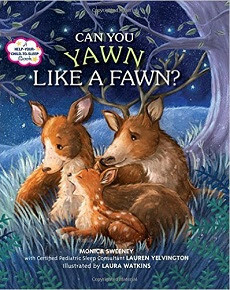 CAN YOU YAWN LIKE A FAWN? For kids who seem to be hard-wired to be "wired," getting to that good goodnight can be a heavy lift. Subtitled A Help Your Child to Sleep Book, this one offers some counsel to the parent who is weary of the patter of little feet from out of the bedroom long after bedtime is past. "Certified Pediatric Sleep Consultant" Lauren Yelvington partners with author Monica Sweeney in a How-To that offers some suggestions on the psychology and physiology of sleep science for tots, with the familiar sleep hygiene advice to darken the room, shutting out outside light and turning off the red, green, and blue glows from electronics, providing warm baths and perhaps adding some white noise. Then there is the siren call of "everybody's doing it!" ALL AROUND THE WORLD, ALL THE LITTLE ANIMALS ARE GOING TO SLEEP. That technique uses the power of suggestion, which brings in author Monica Sweeney, who provides a narrative of baby animals settling down to sleep, utilizing the "yawn response" when we see someone else yawn. After hitting upon the jolly internal rhyme of "Can you yawn like a fawn?" Sweeney invites kids to imitate a series of other yawning bedtime baby critters--a little polar penguin leans on Mom's downy lap, a desert lion cub snuggles up inside the curl of Papa's tail, while a river hippo, a fluffy farm lamb, a kitten by starlight, and a puppy dozing off with Mama Pooch (where else?) on the family bed all indulge in big wide-mouthed yawns. After being exposed to yawning ducklings, an affectionate little sleepy savanna elephant, and a curled-up prairie mouse, the parent reading the story may be the first to yawn, followed soon (one hopes) by the child.